This is the first part of a four part series written for the Vernon Morning Star newspaper during a trip to Sabie in Jan – Feb, 2008. Malaria pills, sunhat, a few summer shirts and skirts all packed. Not to mention two suitcases crammed to within a few grams of the airline’s 23 kg limit, full of colourful fabrics and sewing supplies. I’m headed back to the small rural town of Sabie, South Africa for three weeks where I will meet up with Bev Barling of Vernon who went over earlier. Bev and I are members of Grannies à Gogo: the Vernon-South Africa Connection. “Gogo” is the Zulu word for grandmother. 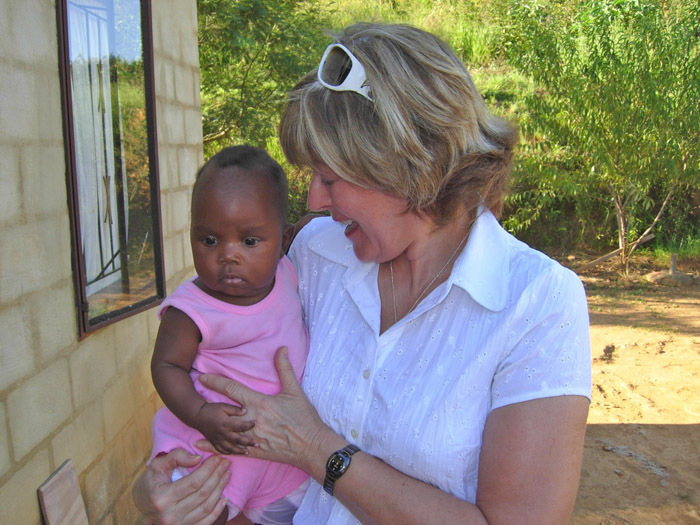 Our group is teamed with a group of about 70 Gogos who are living in impoverished conditions. 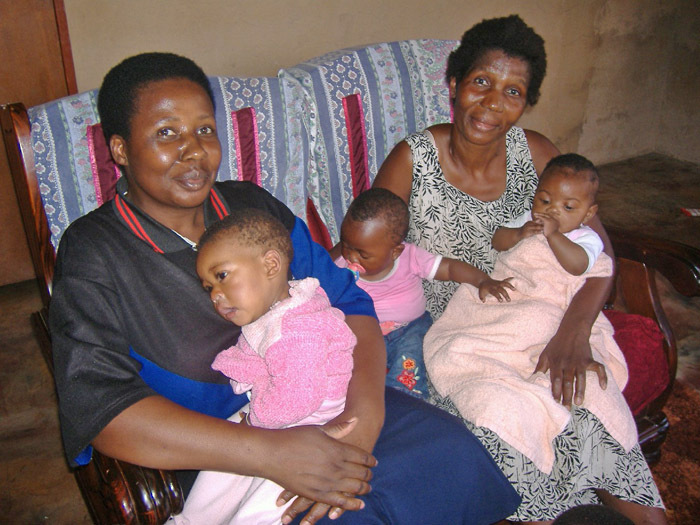 Many have lost their adult children to HIV/AIDS and are now raising their orphaned grandchildren. Our Vernon group assists financially through fund raising and donations. We are also paired one-to-one with the Gogos to develop a personal, supportive relationship through letter writing. I’m eager to hand-deliver about 15 letters upon arrival and give each of them a hug from her “sister” in Vernon. I hope to document each with a photo to bring back to her Vernon partner. A year ago when I visited Sabie, a community I lived in from 2001 to 2005, this project was just a glimmer of an idea. I was familiar with the subsistence lives that many of the African folk led in the townships and their sense of hopelessness. My friend Carducci lamented that every week end there was a funeral to attend. I knew first hand there was tremendous need for both material and emotional support. The project idea hinged on finding a volunteer I knew and trusted, and that was happily resolved when Ginny Uren-Viner, an Anglican minister, agreed to be our administrator. Through her we hired Ruth Magagula, a Home Base Care worker, to monitor and liaise with our Gogos. The small salary paid to Ruth is covered by a Vernon donor. And the reams of fabric mentioned in the first paragraph? Bev Barling will be conducting sewing lessons, an outreach she has experienced previously in the developing country of Nicaragua. She will teach hand sewing, quilting skills, machine skills and, after assessing the situation there, may buy some basic sewing machines with funds raised by Grannies à Gogo. The African Gogos themselves have requested help in making colourful banners for the exuberant gatherings at their various churches. •	visiting many of our Gogos in their homes, some of which are simple shacks without water or electricity. •	assessing their most pressing needs and determining how we might be of assistance. •	visiting Masiba Mbane, the orphan feeding project which, when I was there a year ago, fed 220 orphans twice daily. •	seeing the garden they have dug, planted, fenced and now harvested, which was one of their first projects with funds from Grannies à Gogo. •	reconnecting with a young Canadian woman who’s been in Sabie for three years working with an HIV/AIDS program, and perceiving the situation through her eyes. •	seeing little Lethabo again, who was only three months old when I met her last year. I wonder how she is doing. Is she healthy? Our next report will be emailed from Sabie, South Africa (when internet is accessible – during the rainy season electricity is frequently knocked out) where Bev will report on her sewing experiences with the Gogos. “Sala kahle” (Zulu: goodbye) until next time.